The difference between filtered water and the water that comes out of your faucet can be dramatically different. Not only can it be different in taste but it can also contain a lot more than just water. Therefore, getting the best water filter pitcher is important. In order to get the best water purifier pitcher, there are a few important factors that need to be taken into consideration. This includes the materials that are being used, the capacity of the pitcher and, of course, how good the filter is. That’s where we can help, as we will go through all of those key features and more in our buying guide. 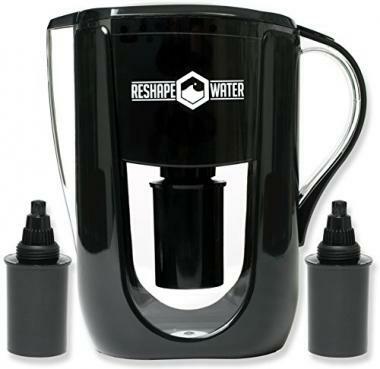 We have also completed water filter pitcher reviews to show you the best products on the market. Once you’ve finished reading this guide, you’ll know exactly what you need. 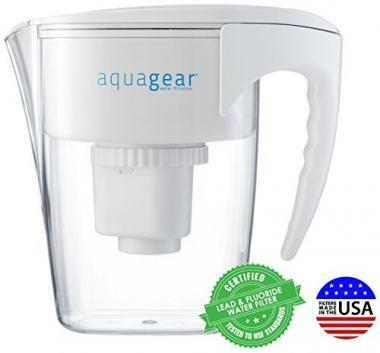 This is a top rated water purifier pitcher from Aquagear that is one of the best products on the market. It has a stylish design and it will easily be able to pour you a fresh glass of water, as it removes more contaminants than many of its rivals. That level of filtration comes from the fact that it has a triple capacity filter that is each able to produce 150 gallons of water and its micron pours will not only leave you with safe water but water that tastes great too. This is a very highly rated product that has a long list of impressive reviews from people who have been using the product for a very long time. It comes with a lifetime guarantee which gives you further assurance that you are going to be getting a quality product. ZeroWater have produced this great home water filter that is able to hold up to 10 cups of water at any one time. That large capacity will mean that you’re never going to run out of water as you will be able to top it up and always have some available. One of the great features of this product is that is has a water meter on the top which is going to be able to analyze the quality of the water. That will mean that you can be confident in the water that you are drinking but it’ll also let you know when you need to change the filter. It has a 5-stage filtration system that will be able to take out 99.6% of dissolved solids that are in the water and leave you with safe drinking water. This another quality product that has a thorough and effective filtration system. This is another great water filters jug from ZeroWater but one that has a slightly smaller capacity and therefore it’s going to take up less space when it is cooling in your fridge. It is able to hold up to six cups of water which is still a good-sized capacity. It’s another product that comes with a water meter that is going to let you analyze the quality of the water that you are drinking. It also has the same 5-stage filtration system that is going to be able to filter out anything that is dangerous or has a funny taste. It has a great design that is easily going to fit in most fridges to ensure that you have cold water whenever you need it. It’s a highly certified filter that is able to do the job it’s required to do quickly and effectively. 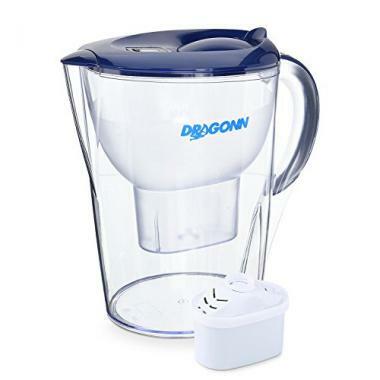 This is one of the best water filtering jugs on the market and has a large 10 cup capacity that is going to be able to suit almost all of your needs. It is also available in a six cup option too if you were looking for something a little smaller. This is also one of the most stylish products on the market as it comes with a lovely wooden handle that is made out of white oak. The rest of the product design is very good too as it is sleek and stylish as well as being a great filter. It is going to be able to reduce chlorine, mercury and copper as well as many more common water contaminants. The lid is able to open automatically and that makes it very easy to refill and the product I made from shatterproof BPA-free plastic. 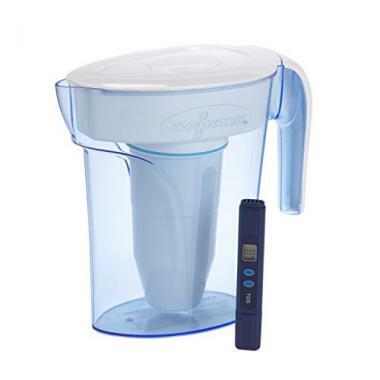 In terms of water pitchers with filter, this is another great example of a brilliant product and one that is going to be able to give you fresh alkaline water as there are thoughts that alkaline has a few health benefits such as containing antioxidants. The plastic used for the container is free of BPA and is highly durable, ensuring that this is a product that should last you for a very long time. It also looks great too and will easily be able to fit inside your fridge. It has a capacity of 3.5 liters and has an easy to fill lid that makes this product highly convenient. You will be able to fill the reservoir without removing the cover to be able to fill up the filter very quickly so you can get that healthy water once again. The activated carbon filter that this product uses is highly effective at getting rid of anything in the water that might harm you. It will also leave it with a great taste too and will mean that you’re more likely to drink water rather than turning to something else. This is another product that has a very attractive design which is helped by the partial wooden handle it has that adds to the charm of the product. The rest of the filter is quite slender to make it highly convenient and easy to place anywhere. It isn’t the biggest filter with a capacity of 1.8 liters but that is still a significant amount of water and it is easily refillable. It will be able to give you a lot of clean water very quickly as it is easy to use with a high level of functionality. 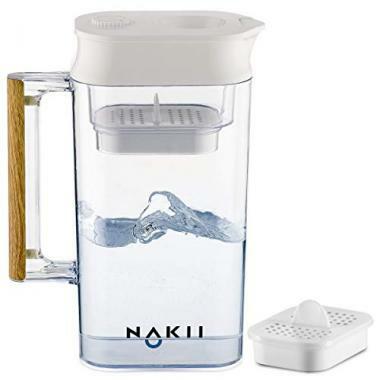 This water filtration pitcher is very highly rated and that is what you’d expect from such a large name in the industry. 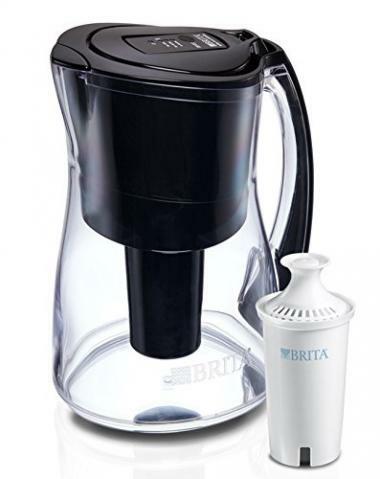 Brita have been able to make this filter that has a long list of positive reviews from those who have used the product for a long time. It’s a large filter that is going to be able to hold up to 10 cups of water but despite that large size, it is still very easy to hold and it will easily be able to pour out the water that you need. It will also be able to fit inside a standard fridge. One great feature of this product is that it has a reminder on it what will let you know when the filter needs changing. The filter change is very easy and you are going to be able to get a lot of use out of it each time it needs replacing. BWT Premium are another company who have been able to make a very highly rated product. That will give you confidence that you are going to be getting a quality product and one that is going to last you for a very long time. It comes with three spare filters which are an added bonus and this is an award-winning filter that is going to be able to give you an incredibly high level of filtration. That will leave you with water that tastes great and you know that it’s going to be safe. Magnesium is actually an element that is found in water that is good for you and can give you health benefits. This product will actually mineralize the water with magnesium that will leave you with great tasting water that isn’t lacking in a valuable mineral that is taken away by other products. This is a product that takes a turn away from the normal as it has a black design which is something different but helps give the product a very distinctive design. It will certainly get people talking when you pull it out of your fridge. It has an overall capacity of 3.5 liters with 2.4 of that being filtered water and the other 1.6 liters that can sit in the reservoir ready to be filtered. That filter is highly effective and is going to be able to clear out any dangerous minerals that might be in the water. It is also a product that is going to be able to create alkaline water if that is something that you would be interested in. The filter it has will be able to filter out 300 liters of water before it would need to be replaced. This is a unique water filter as it works in quite a different way to most other pitchers on the market. It is designed to stay in your fridge and to be dispensed from the bottom. That makes it convenient for a lot of people who would prefer to get their fresh water straight from the fridge. 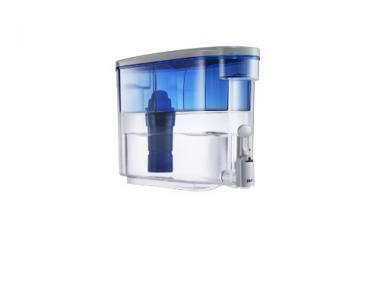 It has a very high capacity as it is able to hold up to 18 cups of water and therefore it is perfect for anyone looking for a large water filter that is going to be able to be used by all of the family. Despite its large size, it will fit perfectly into your fridge. The large weight that it has when filled is evenly distributed and it would fit into the sink for when you need to fill it up. The filter is going to be able to hold up to 40 gallons of clean water so you are not going to have to change it all the time. The materials of the filters are going to be very important in making sure that they last for a long time and will be able to provide you with safe water over a long period of time. Not all plastics are the same and therefore it’s important to know what you are buying. For example, most bottles for soft drinks are made out of polyethylene terephthalate which uses a metal called antimony during its manufacturing process. This is toxin can it can actually leach into the liquid if it’s used for too long. That is an example of a plastic that you shouldn’t use repeatedly and an example of why the plastic used in water filter pitchers have to be of a higher standard. There can be no leaching of anything that finds its way into the water. One of the most common chemicals used in plastics is called bisphenol A which is almost always shortened to BPA. This has been used in many plastic products but has been linked with having a negative effect on your body by replicating hormones. This is why having a plastic that is BPA-free is essential as you want to make sure that you are staying healthy. All of the top brands know the importance of this but it’s something that you should look out for before you decide to buy. While there are other aspects that will make you want to but one of these products, the one that really matters is just how good the filter is and how clean it’s going to make your water. Not only are there different types of filter, but they also vary in effectiveness at getting rid of contaminants. The water that comes through your faucet obviously is safe to drink but it contains dissolved minerals that you don’t want in your body and it contains chemicals like chlorine that are intentionally included to kill bacteria. Here we will look at the key areas and everything you need to know about filters. Types – There are two types of filter that you will see and they are a carbon filter and a cartridge water filter. A carbon filter works through an effect called absorption where minerals will attach to a surface and the carbon filter will have a lot of surface area for them to cling to. This is a natural and highly effective way for a filter to work but over time the holes that are in the activated carbon will eventually get filled up and then the filter will need to be replaced with a new carbon filter. 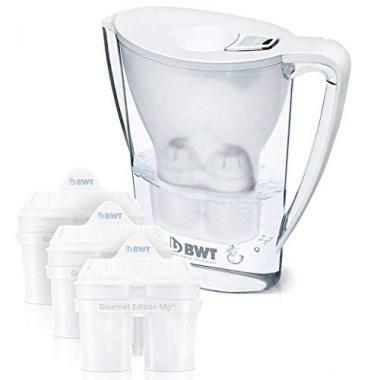 While these are highly effective and are often see in filtered water bottles, filter pitchers often use the other method of a cartridge filter. Cartridge filters work with a lot of the same principles and some of them contain activated carbon in order to form part of the filtration process. This generally works by having minerals attracted to resin beads and trapped there. This can be complicated science involving ion exchange but essentially the water will pass through a series of filters that will clear out the minerals. This will actually take some of the healthy nutrients out of the water but there are filters out there that actually put this back in. 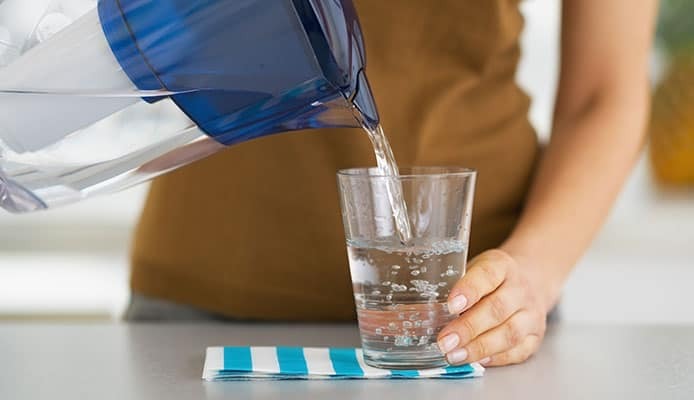 Contaminants – If you drink water straight from the faucet, you are not going to get ill and it doesn’t taste horrible, so what is the need for a filter anyway? Well you’ll know that filtered water does taste a lot better and that is due to contaminants that are removed, with some being unhealthy. Chlorine is the case of the lesser of two evils when it comes to water. It can be harmful in large doses but need to be added to the water in order to kill anything that might be in it and therefore it means you are healthier with it in the water. A filter though will remove the chlorine meaning no bacteria and no chemical. In hard water, chlorine is often what gives it a nasty taste too and therefore getting rid of this will make your water taste a lot better. There are also other chemicals that can be found in the water that actually serve no suppose at all. There are trihalomethane compounds that can be left in there as a result of chlorine treatment and the likes of chemicals that are used as herbicides and pesticides that can find themselves in the water supply too, and your filter will get rid of these. There also certain parasites such as giardia and cryptosporidium to that can cause nasty side effects and they can rarely find themselves in the water too, but an activated carbon filter won’t allow these to pass through and will therefore keep you safe. There will be plenty of other things in your water too but they will be at such trace amounts that they won’t cause any danger to you. You’d still rather not be digesting heavy metals, for example, and a good filter will get rid of these. Health benefits – There are some significant advantages to having filtered water. They are a tempting product to get just for the nice tasting water that you will get but you will also have peace of mind knowing that you are also getting a product that is keeping you in good health. The lack of chlorine is a big part of that. The irony is here that a lot of experts say that you should drink as much water as possible but drinking more unfiltered water would simply mean more chlorine is going into your system. Lead is a heavy metal that can be found in water that was once used in gasoline to reduce engine knocking before it was found to be poisonous. You don’t want it in your system and a filter will prevent that from happening. As we mentioned before, having a filter will also stop you from having to buy bottled water which could well be made out of a plastic where chemicals can seep into the water. There are numerous ways that the filter is going to help your health. When to change it – Obviously when something is filtered, it means that something is left behind and captured to ensure that it doesn’t go in your water. This will eventually build up over time and clog up your filter. When that happens, you will need to change the filter and its good at this stage to check the model that you are looking at and check how often it is recommended for the filter to be changed. If you fail to do this, then you will simply be getting unfiltered water. In order to change the filter, you should follow the instructions from the manufacturer but generally the process will involve soaking the new filter in water for a while as this will activate the filter to start working and once that happens, you can put it into your pitcher. The capacity of the water filter that you require depends on a few different factors and you want to make sure that you are getting a product that matches your needs. It also depends on where you want it to be stored too. 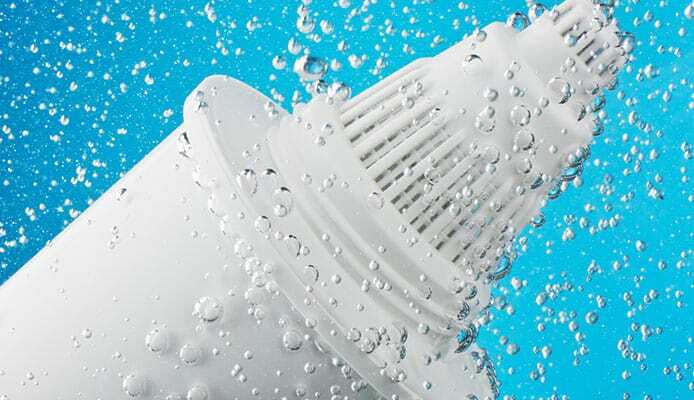 The capacity of a water filter is either given in cups or liters depending on the individual company and it can be hard to work out exactly how much each filter will hold if you are unsure on how the different measurements work and what they mean. A cup is equal to 236 milliliters and therefore a filter that says it has a capacity of 10 cups would have just under 2.5 liters inside of it. If you work better in cup sizes, then a filter that has a capacity of 3.5 liters will contain just under 15 cups. That should give you a better idea of just what size you are getting. You also have to be careful when looking at the capacity of a product too as some companies will display it in different ways. The reasons that this happens is due to the fact that there are two different measurements that you have with a filter. The filter will have the filtered water in the body of the pitcher and it will also have the unfiltered water that is waiting to be filtered. Some companies include this unfiltered amount in their headline capacity whereas others won’t and therefore it’s a good idea to check that. Most filters work in a very similar way but there can be a few differences in how they will work. The size difference between them is also going to play an important factor in how they are going to be carried for one place to another. A large factor in this is going to be weight. 3.5 liters of water as you would get in a filter that can deliver 15 cups would weigh 8 pounds which is a significant weight to carry. A 6 cup pitcher will weigh 3 pounds which is a significant difference. If you are going to be transferring that weight from the sink to the fridge then you need to know whether that is going to be comfortable for you or not. At the higher weight you don’t want to be lifting it too far over your head or reaching. You also want to see how easy it is going to be to pour the water into the filter. With some models they will have a valve where you would be able to just pour it straight in whereas others will need to have the lid lifted up. This seems like a small thing, but it could make a big difference. After that you just want to make sure that the handle and the size are going to be manageable for you and other factors like having a filter that is going to be simple to replace can also make a big difference to the ease of use. There are other filters available if you are going on an adventure such as a backpacking water filter that will be able to give you clean water wherever you are but it’s always important to know how to choose a backpacking water filter that suits you. 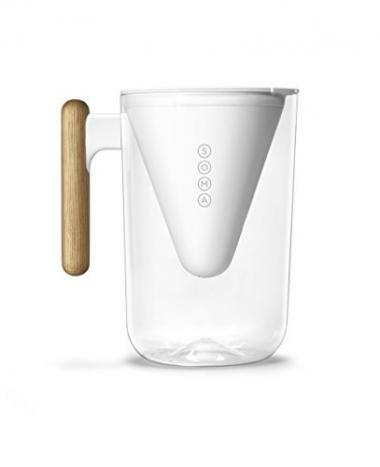 One of the good parts about owning a water filter pitcher is that they are very easy to clean as they are not going to get very dirty over time. This makes to overall maintenance needs of the filter very low and very manageable. The reason for that is due to the fact that the water that goes into the main body of the filter has already gone through the filtration process and therefore there is not going to be any mineral build-up in the main compartment. The one part that catches all those minerals is the filter, of course, but this is a part that you will regularly be replacing anyway. That being said, it is a good idea to give your filter pitcher a thorough clean every so often to ensure it remains safe. One thing that can happen is for mildew to form of the inside of the filter which, even though it won’t get into your filtered water, is something that you want to get rid of. This can usually be scrubbed off or cleaning products can be used, or just a simple vinegar solution. In terms of the rest of the filter, there will be smudges and marks that will build up over time and therefore it is nice to give it a clean every now and again to keep it looking like new. Thankfully cleaning is very easy with these products. 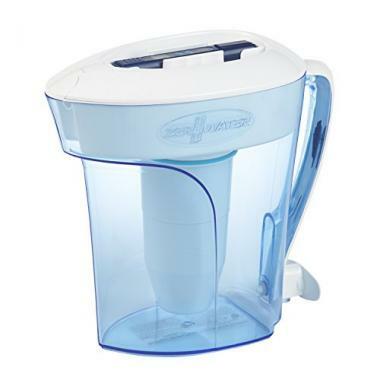 The overall size of the water filter pitcher will be important to you as you’re going to need a place to put it. Some of these filters have a slender design, whereas others will be a lot wider and will be designed to be placed in a different area. The assumption here is that the water filter is going to be placed in your fridge and you need to make sure that you are going to have enough space for this before going ahead and buying your product to prevent any mistakes from happening. This will be a simple process of looking at your fridge and seeing where you are going to have the space in which to put your filter. Some of these products are designed to be placed in the side compartment of your fridge whereas others have been designed to be placed in the main body. This is going to be down to your individual preference and the type of fridge that you have. If for some reason you prefer to have water at room temperature then this wouldn’t matter and you could simply get any pitcher that you wanted too. As mentioned before, the aspect of weight matters too and you don’t want to get a pitcher that is going to be too big for you to handle. Once you have taken all of these factors into account then you are going to be able to get the perfect pitcher for you. Q: Why Use A Water Filter Pitcher? A: There is one great reason to use a water filter pitcher and that is simply that it is going to give you great tasting water. There are a couple of reasons why the unfiltered water that you get out of a faucet doesn’t taste as nice as bottled water. As we have talked about previously, chlorine is the main villain but this has to be added to the water in order to kill bacteria. The other factor that affects the taste is the number of minerals that can be dissolved in the water. A great filter will be able to remove these and therefore you will get a much fresher and a much nicer drink. A lot of those things that can be in the water can also be harmful to your health too, and therefore you want them removed. There are numerous times when you’ll want to have cold filtered water such as when you have come out of your home sauna or finished your run. Drinking healthy, clean water would soon rehydrate yourself. Water companies obviously try and make the water as clean as possible but considering it sits in pipes for long periods, there is only so much that they can do. The filter will remove anything dangerous from the water and keep you healthy. Q: How Often Should I Replace The Water Filter? A: This is an impossible question to answer in terms of giving a specific answer, as each filter is going to be different. If you’ve had a filter before and changed it every 3 months, for example, your new filter might be completely different. Due to that, it’s important to make sure that you are checking the instruction on the product to know exactly when the filter should be replaced. It’s important that you stick to this and change your filter in good time. If you are using the water filter pitcher when the filter has stopped being effective, then the water isn’t getting filtered at all and you might as well not be using the product at all as it’s not completing its purpose. This is why you have to be proactive with the changing of your filter and if you are unsure, it’s probably best to put in a new one just to be sure. You’ll soon find out with the taste of the water though if your filter isn’t working. Q: How Do Water Filter Pitchers Work? A: When people think about filters they will often get a picture in their head of porous paper that will be able to separate large granules from the rest of the water and a great example of this is the filters that are used in coffee machines. Chemicals and dissolves minerals aren’t coffee beans though and therefore in order to remove them from the water, another option is needed and these filters will work by having a series of substances that will attract what you want to remove out of the water. Some substances have a natural connection to each other when water passes through an activated carbon filter, it will go through a series of processes that eventually remove all the bad elements of the water. A lot of filters are actually made from crushed coconut shells which will be positively charged to create the reaction. Q: What Contaminants Do They Remove? A: depending on where you are and how the water is treated, there will be different substances in your water but wherever you are, the water is going to contain a lot of things that might put you off drinking unfiltered water forever. Not only is their chlorine but there will also be the likes of fluoride, lead, mercury, industrial chemicals, arsenic, insecticides, pesticides, nitrates and radium. That is not even the full list either and that is scary enough in itself. A lot of those substances if indigested in large quantities would either kill you or make you seriously unwell. In a cup of water these amounts are going to be extremely minimal but you still don’t want them to be constantly in your system. A filter will remove these and will be able to give you peace of mind. Whether it is changing your hot tub filter cartridge, replacing your pool filter or your drinking water, you always want the water you use to be as clean as possible. Unfiltered water isn’t going to be dangerous for you to consume as your body is going to be able to cope with anything in the water that isn’t H20. You would rather not take the chance though and you never know if the water is running particularly high in one substance or not. You’d rather not have to get your body to work to remove these contaminants from you when you could simply have a filter do it for you. You will also get the huge positive of having water that is fresher and nice to drink. Not only would this be nicer, but it would actually encourage you to drink more water. In order to get the best water filter purifier for you, it’s important to know what size and capacity is going to best suit your needs. There are a few aspects that are going to affect this with one of them being how many people are going to be using it. If it’s a whole family then you would naturally want a bigger filter but if it’s just for yourself, a large size wouldn’t be required. Also you have to make sure that there’s enough space in your fridge to store it and you don’t want it to weigh so much that it’s dangerous. Once you know the perfect size that you need, you will be able to buy your new filter with confidence. Hopefully this guide has given you all the information that you need to pick the perfect filter for you to be able to enjoy that fresh and clean water.